Special thanks to title sponsor Oakley, media sponsor SURFER Magazine and co-sponsors New Era, Futures Fins, Waterman's Applied Science and Banzai Bowls, without which the Surf Shop Challenge series would not be possible. SAN CLEMENTE, Calif., March 19, 2014 – The Oakley High School Surf Team Challengeis back for the third consecutive year with two stops, San Diego and Orange County, in collaboration with the Oakley Surf Shop Challenge. The High School Surf Team Challenge pits 10 high school teams from each region against each other for the two regional titles and a bevy of sponsor prizes and accolades. The first stop in San Diego will hit Seaside Reefin Cardiff, Calif. on March 29th, and the second event will take place at 54th/56th Street in Newport Beach, Calif. on May 31st. 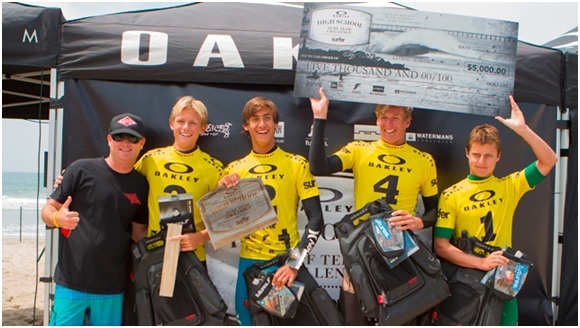 2013 Oakley Surf Team Challenge Orange County Champions: San Clemente High School (L-R Kevin Schulz, Ethan Carlston, Colton Overin, Jonah Carter) Photo: Lowe-White. An onsite Instagram contest at each event will get spectators involved in the prize action with the best post using #HSTC winning a custom Surf Team Challenge iPad Mini, a digital subscription to Surfer Magazine,custom Futures Fins, Waterman's Applied Science Sunscreen products, and Oakley gear featuring the new Oakley Enduro sunglasses. For more information, results and photos go to surfteamchallenge.com. Special thanks to title sponsor Oakley, media sponsor SURFER Magazine and co-sponsors New Era, Futures Fins, Waterman’s Applied Science and Banzai Bowls, without which the Surf Shop Challenge series would not be possible.